Panasonic's IFA conference inevitably centred around the latest television technology, with the Japanese giant offering up the rather beautiful looking 65-inch 4K OLED Viera TX-65CZ950 which sports the company's 4K Pro tech. Panasonic's flagship televisions remain key products, and it insists that its 4K Pro and OLED technology combined brings cinematographer-approved color settings. That's backed up by Mike Sowa, who worked on Oblivion (the bad film, not the good game) and Insurgent, who said: "My world of visual storytelling is based around color accuracy and the need for a display that compliments [sic] the creative vision. 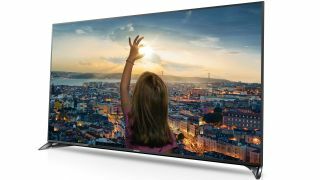 "Panasonic has engineered their newest 4K Pro OLED TV to a standard that I would only expect in professional displays." During the show itself, Sowa added: "We always translate our colour grade movie on to a reference television, to make sure that we perfectly match what is going on in the cinema. "That is where Panasonic stepped in with its new OLED TV. This TV is what I have been looking for. The detail is better than I am used to seeing in the theatrical version. "We can now enjoy the visual product in the home as the cinematographer and director intended." The television also boasts 'Absolute Black' and a likely large price tag that has yet to be announced. It will line up alongside two 'intelligent' washing machines that won't, unfortunately, chat to you about the weather and your next holiday when you are waiting for the cycle to finish but will presumably improve your washing standard. Check out all the rest of our IFA 2015 coverage here.